Very few people understand the marijuana market like Money Morning Defense and Tech Specialist Michael Robinson. He's spent his career – a lifetime – building a massive Rolodex of Silicon Valley insiders, venture capitalists, founders, and CEOs. That's nothing new for our insider, either. Robinson is rarely at home. Most of his time is spent talking to the people closest to industries like robotics, immunotherapy drugs, and 3D bioprinting. The behind-the-scenes conversations he has with these people every day give him a unique perspective on these companies – and insights you can't find anywhere else. 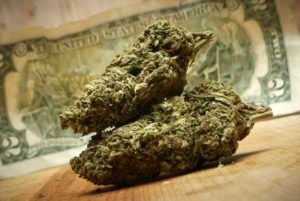 You'd have to be an elite insider to understand this market like he does – and he wants to hold your hand, act as your guide, and show you exactly what you need to know to make a fortune from cannabis companies. And eight times their money on Pharmacyclics. But that's just a handful of the hundreds of winning investments we've handed our subscribers over the years. In fact, we get emails from readers all the time telling us about the money they've made. And individual subscribers have told us about making hundreds of thousands of dollars from our work. Back in 2013, if you'd taken him up on his recommendation to buy Bitcoin when it was trading around $90, you had the chance to make over a $2 million profit… from a single trade. That's the kind of opportunity Robinson sees with the three Canadian cannabis companies. That's why he'd like for you to join him today and get the chance to cash in on the latest and biggest marijuana boom to date.